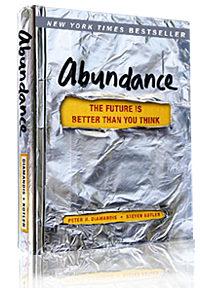 Abundance: The Future is Better Than You Think is a book by Dr. Peter Diamandis (Founder and Executive Chairman of the XPRIZE Foundation) and Steven Kotler (bestselling author and science journalist), published on February 21, 2012. It is a thrilling antidote to today’s dark pessimism. The authors rely on exhaustive research and extensive interviews with top scientists, innovators, and captains of industry to explore how four emerging forces—exponential technologies, the DIY innovator, the Technophilanthropist, and the Rising Billion—are conspiring to solve our biggest problems. Diamandis and Kotler examine the stunning impact these forces are having on categories of critical importance while establishing hard targets for change, laying out a strategic road map for governments, industry, and entrepreneurs, and giving us plenty of reason for optimism. Since the dawn of humanity, a privileged few have lived in stark contrast to the hardscrabble majority. Conventional wisdom says this gap cannot be closed. But it is closing—fast. In Abundance, space entrepreneur turned innovation pioneer Peter H. Diamandis and award-winning science writer Steven Kotler document how progress in artificial intelligence, robotics, infinite computing, ubiquitous broadband networks, digital manufacturing, nanomaterials, synthetic biology, and many other exponentially growing technologies will enable us to make greater gains in the next two decades than we have in the previous two hundred years. We will soon have the ability to meet and exceed the basic needs of every man, woman, and child on the planet. Abundance for all is within our grasp. Breaking down human needs by category—water, food, energy, healthcare, education, freedom—Diamandis and Kotler introduce us to dozens (and dozens) of innovators and industry captains making tremendous strides in each area: Dean Kamen’s "Slingshot," a technology which can transform polluted water, salt water or even raw sewage into incredibly high-quality drinking water for less than one cent a liter; the Qualcomm Tricorder XPRIZE which promises a low-cost, handheld medical device that allows anyone to diagnose themselves better than a board certified doctor; Dickson Despommier’s "vertical farms," which replaces traditional agriculture with a system that uses 80 percent less land, 90 percent less water, 100 percent fewer pesticides and zero transportation costs. As a bonus, the authors provide a detailed reference section filled with ninety graphs, charts and graphics offering much of the source data underpinning their conclusions.Providing abundance is humanity’s grandest challenge—this is a book about how we rise to meet it. Pick up copies for yourself and your friends on Amazon. "I'd like readers to read "Abundance," by Peter Diamandis, because if they do, they'll see that while the headlines are really bad... the trend lines are pretty good." "This brilliant must-read book provides the key to the coming era of abundance replacing eons of scarcity. Abundance is a powerful antidote to today’s malaise and pessimism." "Diamandis and Kotler do a masterful job of explaining why we are at the start of a new era of radically increasing standards of living throughout the world. Abundance is essential reading for anyone looking for a better tomorrow." "This is a vital book. Diamandis and Kotler give us a blinding glimpse of the innovations that are coming our way—and that they are helping to create." "Our world faces multiple crises and is awash in pessimism. Abundance redirects the conversation, spotlighting scientific innovators working to improve people’s lives. The result is more than a portrait of brilliant minds—it’s a reminder of the infinite possibilities for doing good when we tap into our own empathy and wisdom." "This is an audacious and powerful read! Abundance shows us how today’s philanthropists, innovators, and passionate entrepreneurs are more empowered than ever before to solve humanity’s grand challenges." "Beliefs about optimism and abundance are often self-fulfilling. In this astonishingly brilliant book, Peter Diamandis (who is one of the most visionary people alive) and Steven Kotler make a compelling and powerful case about why our future is much brighter than we have been led to believe. If you read only one book this year, this is it." "Having just read your book I wanted to thank you for it. It’s fascinating and inspirational — every politician should read it (but sadly that may be too much to hope for!)" "This engaging book is a needed corrective, a whirlwind tour of the latest developments in health care, agriculture, energy, and other fields…the authors make a compelling case for optimism over dread as we face the exhilarating unknown." "Forget Club of Rome gloom and doom. If the future isn’t necessarily bright enough for shades, then, write high-tech pioneer Diamandis and science journalist Kotler, things are going to work out just fine…A nicely optimistic look at a matter that usually brings out the darkest thoughts among prognosticators…"
"Not only is Abundance a riveting page-turner…but it’s a book that values your intelligence by being honest and shooting straight. Abundance gives us a future worth fighting for. And even more than that, it shows us our place in that fight." "A manifesto for the future that is grounded in practical solutions addressing the world’s most pressing concerns: overpopulation, food, water, energy, education, health care and freedom." "…a godsend for those who suffer from Armageddon fatigue!" "…even the most skeptical readers will come away from Abundance feeling less gloomy…there’s a significant idea embedded within…a range of possible goals we may achieve if we have the imagination and the will." "Top 12 Most Anticipated Business Books in 2012"